Printable Halloween invites for a spooky ghostly costume dress up party or perhaps a childs birthday party. Bright yellow moon on a purple background with a bat flying through the night. 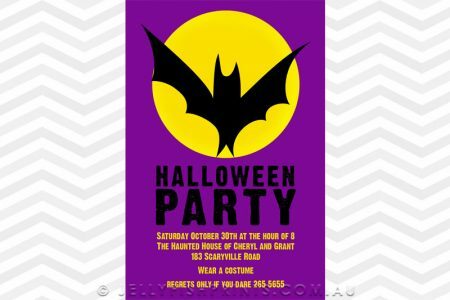 Change the wording to suit your Halloween party and we will customise your invite and send it to you as a Jpeg file for you to print. The 4″x6″ cards cost between 10 and 25 cents to print from popular photo printers like k-mart or snapfish.